When one is being an artist, one must get ideas. But sometimes one can’t get them to the drawing board immediately: they may be working on a project, or about to fall asleep (like that ever stops artists), or have and actual job to do, or just be out and about. During these situations sticky notes come in handy. Now, sticky notes are one of the rare instances where to entire set of products aren’t just called the name of the largest brand (Kleenex for tissues, Oreos for stuffed cookies etc…). Sticky notes are everywhere, you can find them at almost any store for fairly low prices. 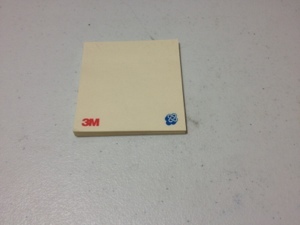 So is it worth paying a little more to get brand-name 3M Post-It Notes? I would say yes. First, for the obvious reason that they are more adhesive than most other brands. I know that sticky notes are made to be easy to peel on and off, but I still want them to stay where I put them (I’m convinced that the T.V. shows use glue to hold their sticky notes on those boards). Second, they’re a great size. I hate those thin, flimsy sticky notes, and the ones that come in different shapes are annoying to place and serve no purpose. Any bigger and they would be cumbersome, any smaller and one couldn’t write on them. 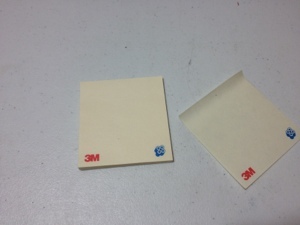 Now I do realize that other companies make their sticky notes in the same size, but the quality is lacking, which is the third reason I like 3M Post-Its. The quality of the paper is unmatched in any other sticky notes to my knowledge. You might not think it matters how good the paper is on a sticky note. But being able to simply write something and stick it somewhere without having to worry about the paper or your message being damaged is a great thing. So yes, 3M Post-Its are worth it. They are better than the competition in every way one would want a sticky note to be better (and they make awesome bookmarks). They stick, write, and place well and are a must have for any office and artist.